If you’re on Facebook, please click the “Like” button above, thanks! We used to have this great restaurant in Huntsville called Darryl’s. Everyone loved that place. As a teenager, anytime homecoming, birthdays, or any other eating out occasion rolled around, we all went to Darryl’s. It got to be kind of funny because you’d show up with a date or a group of friends and it would turn out more like a class reunion with practically every other table filled with folks you know. Unfortunately, Darryl’s closed a good while back. 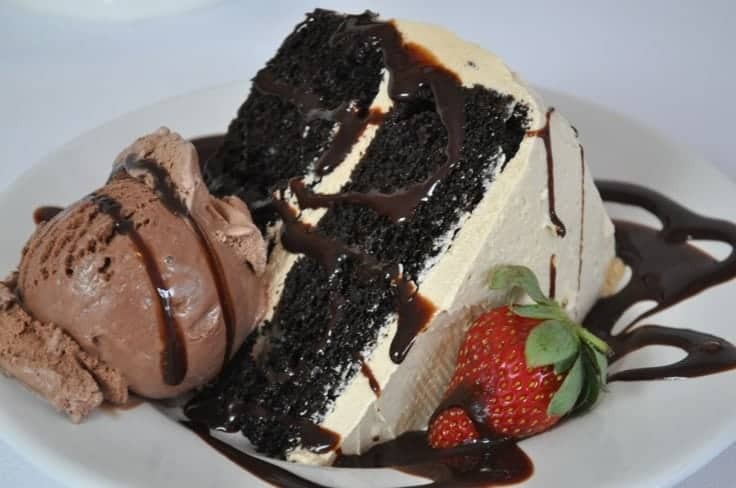 There is only one remaining in North Carolina, but I live in Alabama so I’ve spend over ten years pining away for my very favorite thing on their menu – Cappuccino Cake. Cappuccino Cake was one of their signature desserts and they always brought out a huge wedge of it for birthdays and special events. My sister got her first job working there as a hostess and we’d never been more proud of her than when we’d come home on the rare occasion and find an entire cappuccino cake in our refrigerator! They served it cold (I think it is better that way) with a side of chocolate ice cream and generously drizzled chocolate syrup over the whole thing. This is a deep dark chocolate cake iced with a whipped cappuccino buttercream icing. Does it get any better than this? Maybe, but not right now because right now, we’re focusing on this little side of heaven :). After pining away for over a decade, I decided it couldn’t be that difficult to duplicate the recipe so I set out to do just that. 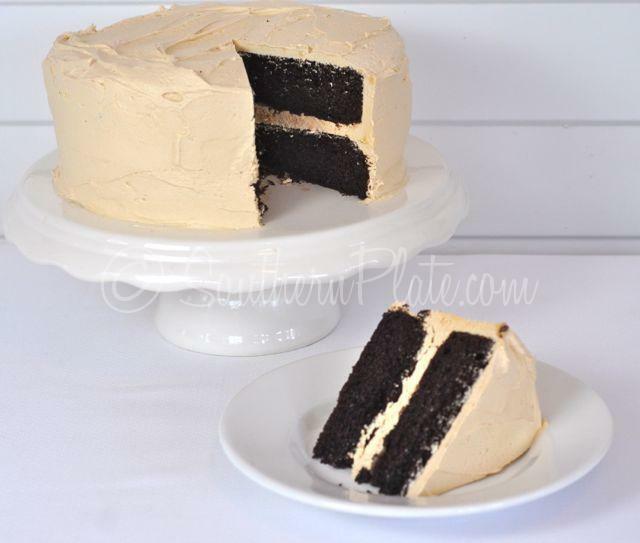 You can’t find a copy anywhere on the internet so I went by memory and a basic starting point of dark chocolate cake, coffee infused buttercream – and we have a winner. We have grand prize winner. This puppy deserves one of those 6 foot tall trophies. If I didn’t share this recipe I could retire and just bake Cappuccino cakes the rest of my life. But it’s not nice not to share recipes and I don’t really want to wash that many dishes. I hope you get to make this soon. It is definitely a showstopper cake perfect for any special occasion. Come to think of it, today seems pretty special to me, doesn’t it to you? 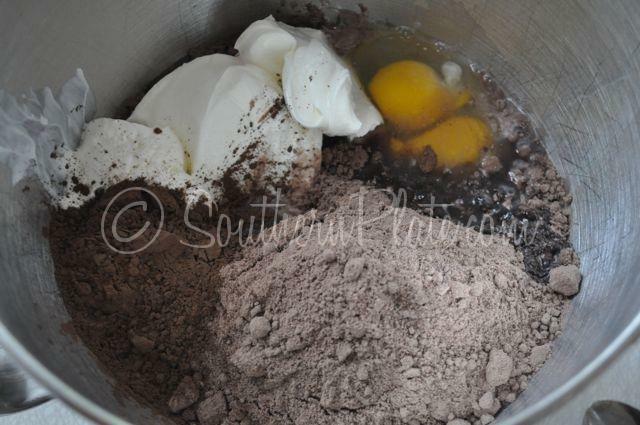 Chocolate Cake Mix*, milk, sour cream, eggs, dutch process cocoa powder (dark cocoa powder), and oil. *You can use any dark chocolate cake mix such as devil’s food, dark chocolate, or even regular chocolate if you like. You can also use your favorite chocolate cake recipe if you like but I like this one because it is dense and extremely moist. 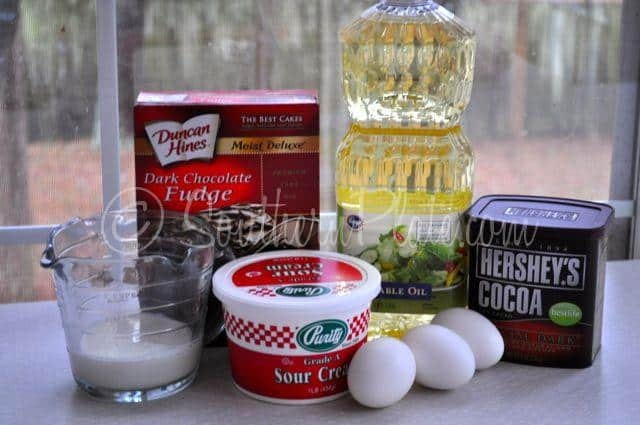 In a mixing bowl, place all of your ingredients. Mix that with an electric mixer until well blended and smooth, about 2-3 minutes, scraping down sides as needed. Some folks have you add gradually but unless you’re just now joining this party, you know I’m really not a gradual person. 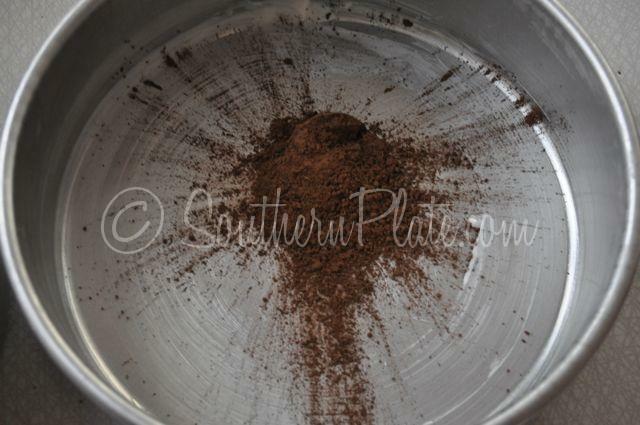 If you are just now joining this party Welcome to Southern Plate! Come holler at us on Facebook so we can all welcome you proper and love on you a bit! Be sure and visit our Front Porch forum too. There is a recipe sharing and request forum that has literally hundreds of recipes already on it. We have fun there 🙂 You have to register to post but once you register, we’ll approve your account and you have Front porch and sweet tea privileges for the duration! 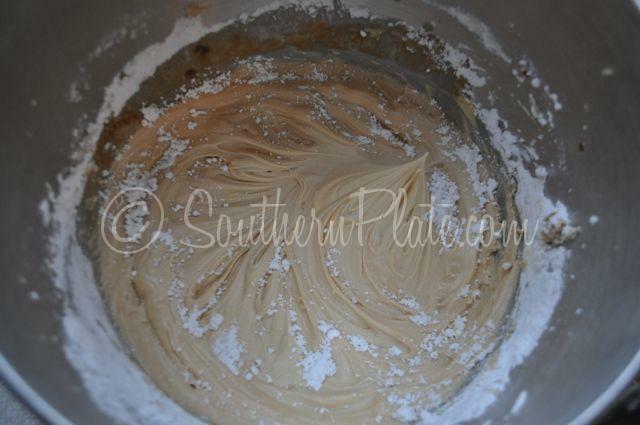 While that is mixing, grease two or three 8 inch round cake pans. I’m only using two. 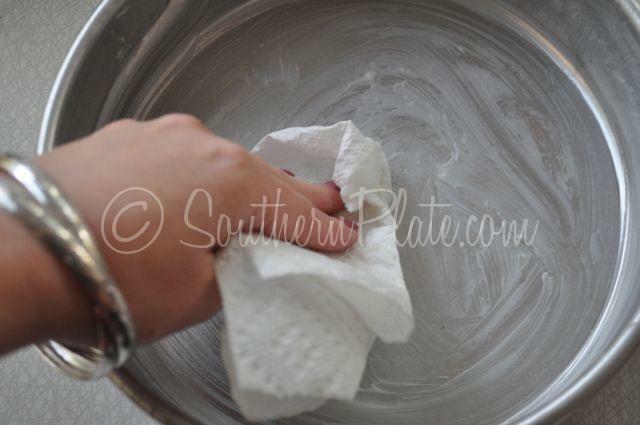 To grease my pans I fold up a paper towel and dip it in vegetable shortening and then smear it around real good. 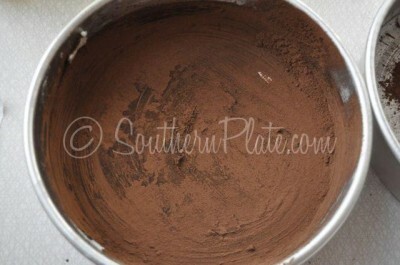 tilt your pan all around while patting it to distribute it evenly like this. Then you divide the batter evenly between your two baking pans. This batter is going to be really thick and will likely remind you of jello. Remember, never ever eat raw cake batter. But I don’t count licking it off the spatula as eating it. Bake cake layers in the oven at 350 for about 25 minutes, or until a toothpick inserted in the center comes out clean. Note: If you are making more than two layers, check on them after twenty minutes. Mine are thicker since I’m only doing two layers so they will need to cook longer. 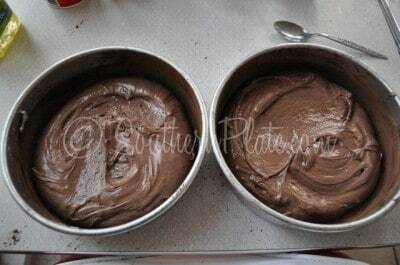 Once they are finished baking, remove from oven and let sit in the cake pans for ten minutes. After ten minutes, turn cakes out and allow to cool completely. Time to make Cappuccino Buttercream Icing! 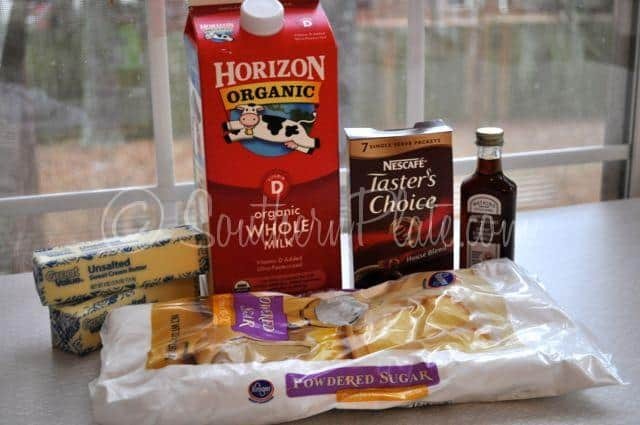 You’ll need: Butter, milk, instant coffee, vanilla, and powdered sugar. I only use instant coffee for recipes such as this so I got those neat little packets that have a sleeve you open for each cup. They were just $1.00 for a box of seven so that seemed like a pretty good deal to me and my instant coffee stays fresh for whenever I need it. When it comes to my daily coffee, I need the hard stuff. The real stuff. I’m talking coffee so strong you’d have to put quarters on your eyelids if you wanted them to shut anytime in the next eight hours. Take the instant coffee and stir it into your milk until dissolved. You don’t have to heat your milk first though. 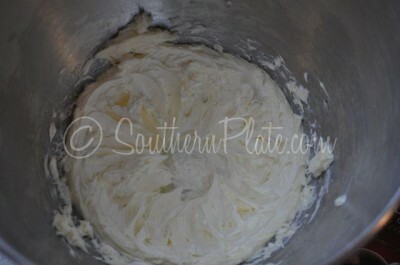 Place your well softened butter in a mixing bowl. Beat for a minute or two, until fluffy like this. Add in all other icing ingredients. 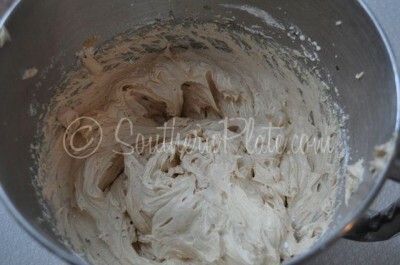 Now crank up that mixer again and beat this icing until it is fluffy, 5-7 minutes. If you haven’t tasted this icing by now, I’d sure like to know where you get your willpower from. Time to ice the cake! This cake is best if made ahead and refrigerated until good and cold. I know that is torture but just try it for me once, it’s totally worth the wait! Serve with chocolate ice cream, chocolate syrup (I used Hershey’s) and a strawberry. Grease pans with shortening and dust with cocoa powder. 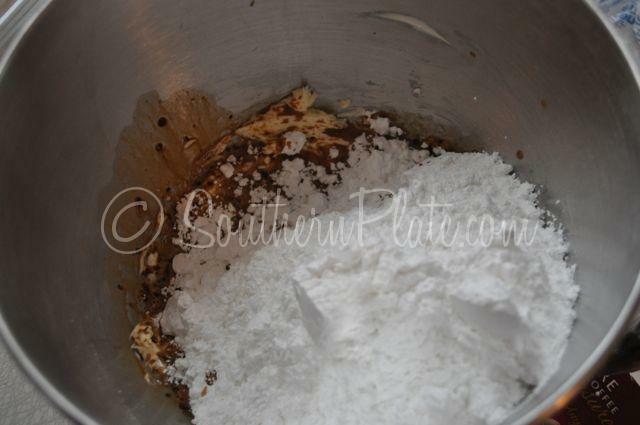 Place all cake ingredients into a mixing bowl. 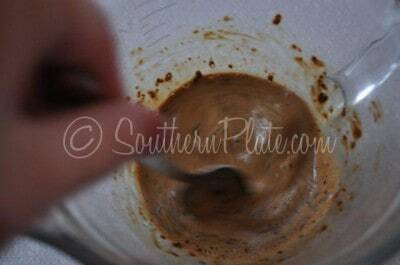 Mix about two minutes with an electric mixer, or until well blended, scraping down sides as needed. Divide evenly among prepared pans and let cook until done, about 25 minutes. Let sit in pans for ten minutes before turning out to cool completely. 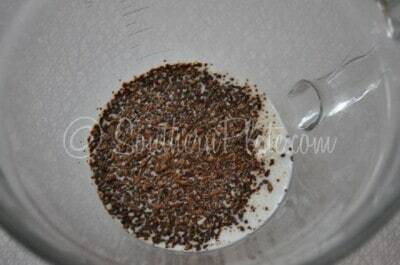 Stir instant coffee granules into milk until dissolved. Place well softened butter in mixing bowl and beat until fluffy. Add all other ingredients and mix until smooth. Scrape down sides. Beat with mixer 5-7 minutes or until fluffy. Ice cake and refrigerate. Best if served cold with chocolate ice cream and drizzled with chocolate syrup (such as Hershey's). This cake translates very well to a 9x13 if you'd like to save some time! The honeycomb is one of the strongest structures designed. Strengthen those around you with uplifting speech. Everyone needs cheerful words these days. Life and death are in the power of the tongue, Choose LIFE. ~Submitted by Marilyn Miller. Click here to submit your quote. This cake (with a chocolate icing tinted black) will be perfect for my hubby’s 50th birthday next month! You’re such a good wife!!!!! Oh I’d hug you if you were here!!! Cap cake was my all-time fav dessert!!! I went to college at UNC-chapel hill and there were Darryl’s everywhere in that area…like you said, i celebrated my 21st BD there…when all the restaurants closed, I searched high and low for years for the cap cake recipe and now here it is!!!!! The pic looks just like it…I was actually in Greensboro, NC last month and the only remaining Darryl’s is there and they still have the cap cake…it was divine!!!!!!!!!!!!! Cannot wait to make this!! You have always been wise beyond your years, Debbie! I used to work at Darryl’s in Huntsville and yes this was my all time favorite cake. I even requested it when I was in the hospital having my first child! I’m SO GLAD you posted Becky!! I was hoping I wasn’t the only one obsessed with this cake! Isn’t it amazing? Ok Christy you have made my day! Just like you said we would go to Darryl’s and have that cake for all kinds of special occasions especially my birthday here in Montgomery. I cannot wait to make it!! My husband and I have wished for years we could have the Cappuccino Cake one more time. Now we can! Thank you so much. OH YAY!!! Thank you so much Cindy! Please report back and tell me how it goes over! Oh Kim, thank YOU so much for taking time to chat with me today, your words mean so much to me, truly. Some days I work all day and wonder if anyone is “feeling” my heart in all of this and then someone as sweet and wonderful as you comes along! Ahh, Daryl’s! Wow, I really miss that place. There was one in Nashville, too, and my favorite thing was the big crackers they served with Ranch dressing as your appetizer for every meal. I still haven’t found crackers like that, but I do find myself dipping saltines! You know what’s funny? When we’d go to Nashville for the day, we usually ate at Darryl’s then, too, even though we had one here! lol I loved those crackers also. Once my sister brought us home a whole box!!! I hope you like it Sandra, I can’t seem to keep myself from a little taste every time I walk by. You are a great cook I bet! Would love to bring my family to eat with yours!!! Yummmmmm!! Ohh, thank you so much Star! 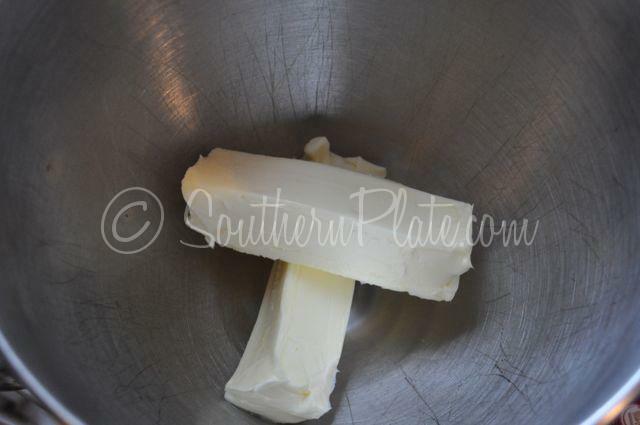 I bet you are a wonderful cook too and wouldn’t it be something if we could all get together one day and have a HUGE dinner for all the Southern Plate family!! Christy…Just say when and I will be there. How large is your yard? We could have an old timey social like dinner on the church grounds. Bet we could make a week end of it, like a family reunion and eat and enjoy the fellowship and fun. I’m pretty sure that I had dinner at the original Darryl’s in Raleigh back in the late 70’s early 80’s. Another trip I had dinner at the Angus Barn which belonged to Thad Eure, Jr, one of the Darryl’s partners. My hubby worked with the mother of the guy that procured the cool antiques and decorations for all the Darryl’s. I’ll love trying the cake. Oh WOW Marcia!! That is so neat. I hope you like the recipe!! I have very fond memories of Darryl’s in Lexington, KY and Nashville, TN. We planned our trip to the UGA vs KY or UGA vs Vandy football games so that we could eat at Daryl’s two times during that football weekend. We loved their crackers, their BBQ ribs, and the ice cream sunday dessert that was big enough for two ( or more). We never tried the cake. I still get excited just hearing the name: Daryl’s. Nothing is quite like Daryl’s. Look forward to trying this cake. Thanks for the memories. I can’t wait for you to try it Carol, I hope you like it!!! Oh, Lord, I forgot about that humongous ice cream sundae! It was to die for! Christy girl, it is easy to see and feel the heart you put into everything here ! I look forward to your posts first thing every morning. You always bring an extra smile to my face ! and sometimes I just laugh right out loud ! This cake looks divine, there’s only one problem. I do not like coffee, you heard me. So would I still like this cake ? I think you just might like it Joyce. It isn’t an overly strong coffee taste, just the right amount in my opinion. Thank you so much for your kind comments!!! Oh WOW, what a wonderful memory Holly!! I hope you like the cookbook and I hope you love this cake!! Wow, this looks fantastic!! I’m not a coffee fan though, could I somehow substitute cocoa for the coffee? I don’t see why you couldn’t Eve, it will totally change the taste. Let me know if you try it. This sounds sooo good! I can’t wait to try it. My daughter will love this when I make it for her. I will just go ahead and thank you in advance for her. Awww, I hope she loves it, but I have a feeling you will get Mother of the Year award!! OK, now I have drool on my keyboard! Can’t wait to try it! ~giggles~ I can’t wait for you to try it Barbara!! Have mercy girl…I’m never gonna lose a pound with great recipes like this. Oh well, can’t have your cake and eat it too! I’m gonna have cake! OK THIS is a definite keeper AND will be my daughter’s birthday cake in April. She will absolutely freak out when I pull this one out ….. especially since it will be right after tax season ends (well the worst of it anyway) so she won’t be expecting it at all. Thank you so much for sharing this one! I’ve already added it to my Ziplist Recipe Box. I hope you enjoy it Kat, I can’t seem to get enough of it! This cake looks and sounds amazing! Thank you Christy for sharing with us! My husband would love this cake! I worked at Darryl’s in Pineville, NC when I was in college at Winthrop in Rock Hill, SC. I haven’t thought of Darryl’s in ages! We used to go there as a family. We kids thought it was the greatest treat! Lots of good memories. I think it was already gone by the time I was old enough to drive in Huntsville (from Athens- HSV was a bit intimidating to this beginning driver). But it was a great place- Italian night is scheduled for our Bible study meal this week- I think I will add this to my offerings in honor of Darryl’s and sweet memories. How long can cake stay of fridge with this frosting? Christy, this cake looks divine. I cannot wait to make it. You are so creative in the kitchen. It’s a good thing that I can’t gain weight by just looking at the recipe. Christy, this cake looks amazing and I can’t wait to make it. I was wondering if you think it will work just as well in a 9×12 cake pan? My husband is a Police Officer and they love sweets, so I would really like to make this for them and it’s always easier to make it in a disposable 9×12 cake pan. Thank you so much for all of your recipes and wonderful stories. It will work perfectly in a 9 X 12!!! OK, I just made your Granny’s Sheath Cake (in the 9X13 as you urged) for my honey bunny’s birthday but he’s a HUGE fan of dark chocolate (he always gets several different kinds in his stocking each year) and he would’ve loved this one too! But, he loved Granny’s.. and there’s always Valentine’s… hope this one’s going in this next cookbook, WHICH I am anxiously awaiting.. BTW, he hadn’t had Okra & Tomatoes since his grandmother made it for him as a child (ummm.. 50+ years ago….) and low and behold, you had a recipe for Okra & Tomatoes in your fab cookbook, which I also made.. and which he also loved! Said it brought back childhood memories of his beloved grandmother. Thanks for keeping traditions alive. I worry about losing those recipes from childhood and am forever attempting to make things like Date Nut Loaf (that candy of yesteryear) and peanut brittle (not as simple as people who haven’t tried it think…) and fried corn, etc. I was shocked at how many of my grandmother’s dishes were in your cookbook. It’s a blessing and a treasure. p.s. I just pinned this cake for all the world to enjoy!